To Blog or Not To Blog: For that weird someone. Well I had a marvelous idea that was greatly inspired by FuzzyRed (aka FuryRed). I decided to have a mish mash of editing and sims pictures in order to create a certain something. Because we all have a bit of pokemons lovin' in our heart. [P3] Grimreaper fainted! 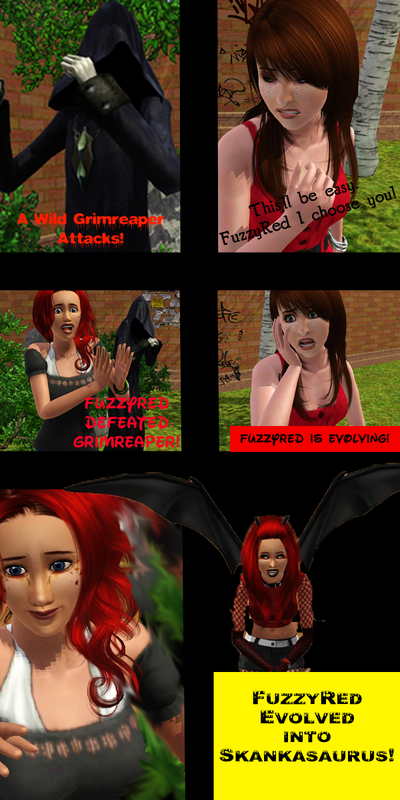 FuzzyRed got 666 EXP! FuzzyRed rose to Level 238! [P4] What? FuzzyRed is evolving!